This is chapter #5 of the drop shipping quick start guide. To go to the list of chapters click here! Now that you have selected a product and suppliers, and you are ready to start your drop shipping business. As you know several sales options are available to you like drop shipping ebay, amazon, self store and others. Would you go for one option or try couple of options. 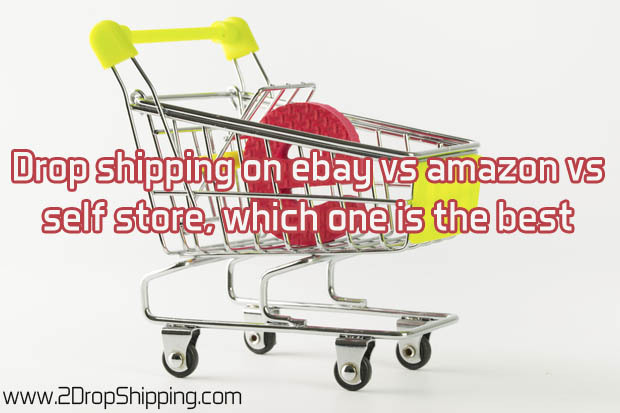 Here in this article we will detail drop shipping ebay vs amazon vs self store and then we will conclude which option is best for you to adopt. So let’s dive in. Ebay is the world’s largest auction website for physical items. ebay is the site known everywhere. Here are some advantages and disadvantages you might find helpful when doing drop shipping business on ebay. Ebay is easy to start with: ebay is easy to use; in fact once you create an account you can immediately list your items and start your business. Large audience to market to: Listing on ebay means tons of online buyers will see your products. And the fairly strong and active market will help ensure you get the best price for your products. In addition, it is easy to reach international markets with ebay. Credibility and trust: Ebay is a very renowned! many customers especially new ones may be more comfortable buying from ebay rather than buying buying from a website they are unfamiliar with. 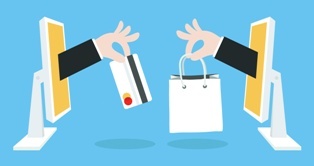 Less marketing effort: When you are selling on ebay, you are selling on a giant platform. This will reduce your marketing, SEO, and traffic finding. As conclusion you save more time and money when selling on ebay. Be noted that when we say less SEO does not mean never to use it. For example, you are better to use some SEO tips like incorporating best keywords in your contents. Listing fees: The major obstacle to eBay is the fee you’ll have to pay. The most outstanding fee is the selling fee which can be 10% or up of any item you sold. This will narrow down your drop shipping profit margin. Constant monitoring and re-listing: eBay is an auction marketplace, so you’ll need to be continuously monitoring and re-listing your items. Although some tools may help automate the work for you, but it’s still not as straightforward as listing on your own ecommerce website. Can’t customize your sales platform: You must follow ebay rules and template design when listing on their marketplace. 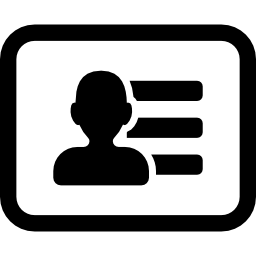 Making it more complicated to create a professional, value-adding page for your customers. No long-term connection with customers: when selling on ebay it is hard to wait for a returning customer. So any good reputation you make through excellent customers service will likely be gone. Ebay does not focus on the merchant (you), they instead focuses on the items you list. This will put more restrictions in how you communicate with customers, how you brand yourself, design of your store, etc. You’re not building an asset: Imagine that you have your own store that generates huge amount of traffic, has returning customers, and sells well, this is a valuable business that you can sell to other entrepreneur for good cash. However when you sell on eBay, you’re not building a permanent brand or web property that can be sold in the future. Any new eBay seller who tries using drop shipping will find that they can’t access their money until the product has been sent to the customer. This removes one of the most appealing aspects of drop shipping – the ability to sell items and then use the buyer’s payment to fund the purchase. To solve this issue we recommend that you start with a cash capital of about $500 – $1000 so that you can buy the product if paypal holds your fund. By time you are good seller ebay will sure remove the holding. If ebay stops you must stop: This is the worst scenario. If ebay stops or bankrupt you will have to stop as well. Although this hypothesis is so far from reality. Although Amazon stocks and sells lots of products, many of the items listed are sold by third party sellers through Amazon’s platform. Amazon acts like ebay. It facilitates the sale and solves any problem that may occur. In general both ebay and amazon have some common pros and cons. Like ebay, amazon is easy to get started, you have an access to a big number of customers, huge credibility and trust, and you don’t need to focus much on marketing and SEO. In addition Amazon offers their own fulfillment process (Fulfillment by Amazon) which is one of the most advanced fulfillment networks in the world that allows you to sell your items without having to deal with packing, shipping or warehousing. FBA can also assist you scale your business and reach more new customers. Listing fees: Like ebay, you have to pay a certain commission fee in order to have access to the Amazon’s huge network of buyers. Amazon’s commission fee varies by the type of the product and often ranges from 10% to 15%. Again, if you’re working with quite small drop shipping margins, this fee will reduce your total drop shipping profits. Exposure of sales data: One risk sellers face using Amazon is that Amazon has access to all of your sales data, from the best selling items in your collection to how much you’re selling overall. Amazon has been accused of using such data to identify great selling opportunities and reinforce its own involvement in the niche, eventually pushing out other merchants selling via its marketplace. No long-term connection with customers: like eBay, it’s unlikely that you can build a long term relationship with your buyers. Amazon focuses on products not on seller (you). In amazon you will be restricted on things like branding, products displaying and communicate with buyers. No customization: In Amazon you are likely to be controlled by Amazon’s standards. And you will have limited customization to branding, UI and marketing. Establishing your own online store to sell items on is the best substitute to selling through third party websites like ebay and amazon. This method attracts lots of sellers interested in building a successful online drop shipping business. More control: When selling on your own established online store you will have more control on your design and layout, and you can create highly optimized custom product’s pages that convert very well. This control over your own store will help you sell more and most importantly adding value to your customers. Easy design: Building your own online shopping store is simple, mainly with shopping carts like bigcommerce and Shopify. (we will review best shopping cart options later on here in this website 2DropShipping.com so make sure to subscribe by email to be notified). With the help of shopping cart you can easily choose a store template out of dozens of options, make any customization you prefer, add your products, select a payment gateway and you’re up and running. In many cases you can be up and running in just one day! 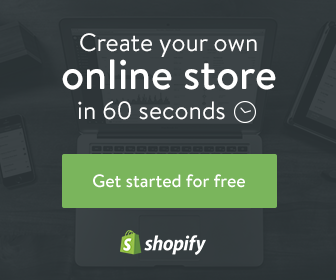 Some shopping cart, like Shopify, lets you manage your business from your mobile device. This is exciting to drop shipping business owners who often like to manage their business on-the-go. No third-party fees: You will not have pay 10% to 15% of every sale to Amazon or ebay which will notably improve your profit margins. This means that you will keep your total profit in your pocket. You have a real business: Having your own online store allows you to build a long term business with equity. It’s much easier to sell your business to new owner if you would since it is independent. Less traffic: In your own store you will have to put time and money to important things like marketing, traffic, SEO, paid ads and things like that. And you will need to be ready to invest in a long-term campaign to promote your store. Increased complexity: on ebay and amazon you don’t have much hard configurations to play with; you simply fill out your listing information and you are ready to go. However, with your own store you’re responsible for configuring the design, layout and the formation of your store. And if you have self hosted store you’ll then be responsible for any technical configuration associated with your store and server. Which Sales option should you go for? So which sales option or platform should you go for? There are many things to consider, and different shopping platforms will be better suited for different people and situations. If you are new to drop shipping or just starting drop shipping business as a hobby, then selling on amazon and ebay can be good enough for you to explore the world of drop shipping especially if you can find items with enough profit margins. There are many people making good money selling on Amazon and eBay. So if you can find the opportunity go for it. However if you’re serious about building a long-term business, we advice you to start your own online store. As mentioned above, it offers the most flexibility, customization, branding, ability to connect with customers, and so much more. Although you’ll need to invest in marketing and promotion, mainly in the starting up stage, but we think it offers the best long-term potential and is actually the best option for those who want to build a serious ecommerce. Also, it is possible to sell side by side with amazon and/or ebay and with your own store especially when you are in early stage. in fact many big online merchants sell that way. Now what about you! which sale option you think is the best? please comment below and do not forget to share the post with friends if you like it. Drop shipping on ebay vs amazon vs self store! several sales options are available to you like drop shipping ebay, amazon, self store and others. Would you go for one option or try couple of options.